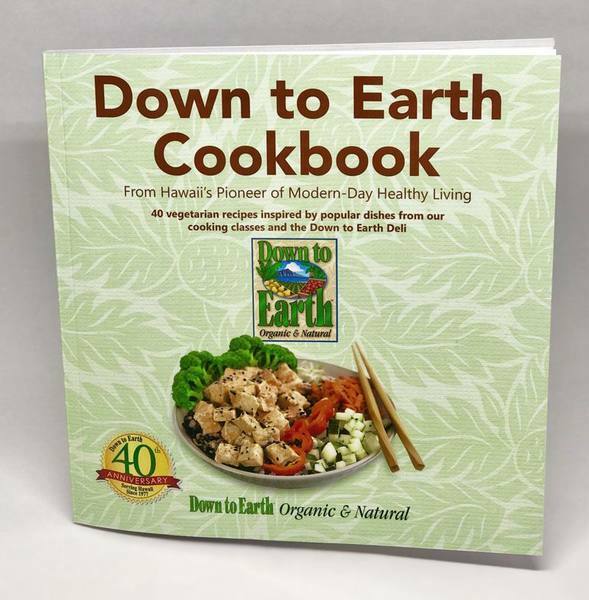 The Down to Earth Cookbook is a soft-cover 112-page book that contains forty vegetarian recipes, one for each year of the forty-year history of Down to Earth Organic & Natural. Down to Earth is Hawaii’s leading retailer of local, fresh, organic, and natural foods. The company is unique in that it has always been vegetarian, and it is one of only a few all-vegetarian stores in the nation. Many of the dishes in this collection are inspired by the most popular dishes from the company’s cooking classes and deli. It also contains recipes for particularly tasty dishes from the vast collection posted on the company’s website at www.downtoearth.org/recipes. All the recipes are home style and easy to make. The cookbook includes a review of Down to Earth’s history beginning with its start on Maui in 1977. A walk down memory lane shows how the company has grown and continues to honor its vision to help improve the health of Hawaii residents through organic and natural products and a vegetarian lifestyle. “This mission has enabled us to become one of the leading independent natural food store chains in Hawaii and the country,” says Fergusson. The collection of recipes in the Down to Earth Cookbook is a collaboration by vegetarian chefs of the Community Outreach Team at Down to Earth. People are drawn to a vegetarian lifestyle by all sorts of motives. Some of us want to live longer, healthier lives or help improve the environment. Others have made the switch to be vegetarian because they want to preserve Earth’s natural resources, or because they love or care about the animals and are ethically opposed to eating them. Some people just like to try different types of cuisine. Regardless of the reason for your interest in vegetarian cooking, our aim with this cookbook is to provide you with recipes for the tastiest, most popular dishes from our cooking classes and the Down to Earth Deli that have withstood the test of time. Customers keep asking for these recipes. The recipes of our Deli items are an important part of our business so unfortunately we do not provide them. However, we can do the next best thing for you! We developed alternative recipes for many of the most popular deli items and have included them in this cookbook. You also will find in the cookbook popular recipes from our cooking classes and other particularly tasty ones from the vast collection posted on our website at www.downtoearth.org/recipes. This cookbook features 40 of the best recipes to honor our 40 years of service to Hawaii. All the recipes are home style, and easy to make. We hope you enjoy trying them out as much as we enjoyed putting this cookbook together for you.